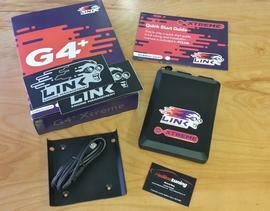 The Link G4+ Xtreme. Powerful engine management for high end applications and ideal for V8s with eight ignition and fuel outputs. Flexible options over the control of inputs and outputs allow the user to design their own functions to control all sorts of devices. Precise control of injectors and ignition angle are guaranteed at very low or high RPM or manifold pressures. A very high level of protection from interference and tolerance of trigger input errors has been built into this ECU, ensuring a smooth running engine even under the most demanding conditions. Requires "A" & "B" Looms.